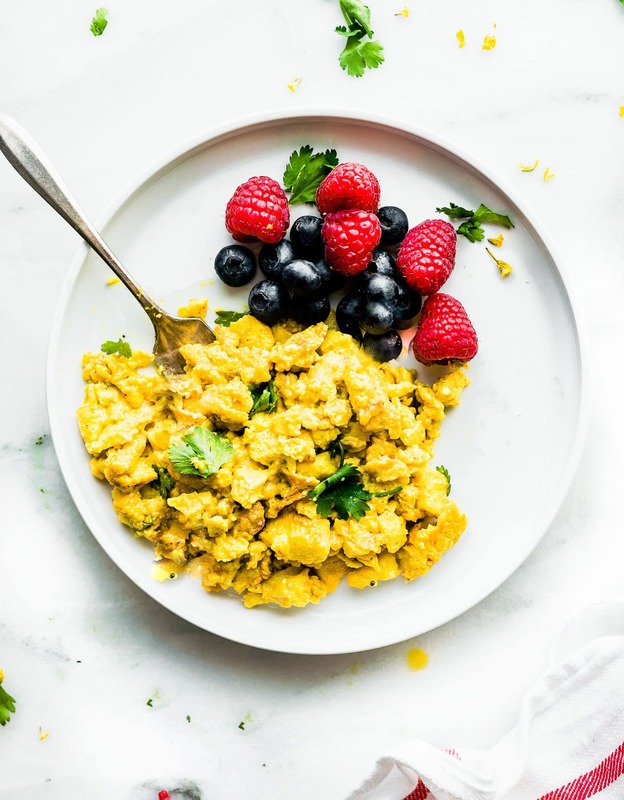 Healthy meal prep starts with this anti-inflammatory breakfast recipe for Turmeric Oven Scrambled Eggs. 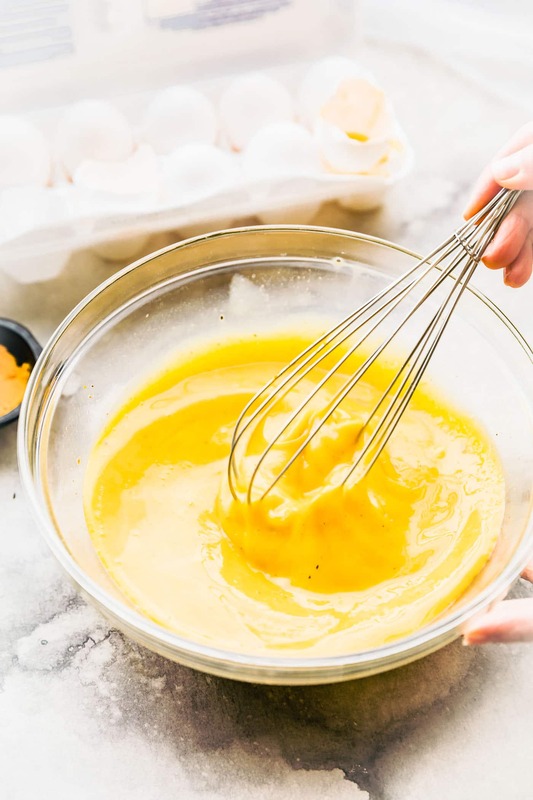 Baking eggs in the oven is a great way to prep healthy meals for the week, and turmeric helps battle inflammation while brightening the flavor of ordinary scrambled eggs! This Turmeric Oven Scrambled Eggs recipe is sponsored by the good people at Eggland’s Best!. Thank you for supporting the brands that help keep the gluten free meal prep and meal plan recipes cranking out of the Cotter Crunch kitchen. If you are new around here, you may not know this, but I have a love affair going on with turmeric. 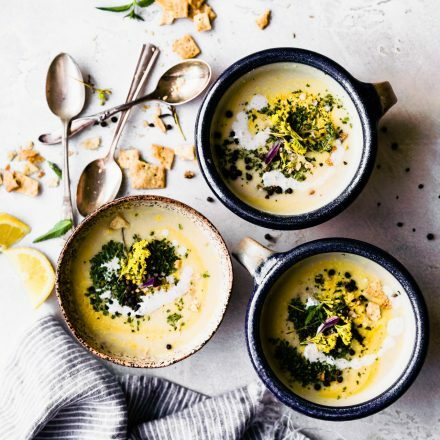 The inflammatory fighting compounds, its golden hue, the earthy taste – I like to add it to my meal plan as often as possible. And this amazing spice pairs perfectly with just about ANY food or recipe! Yep, it’s a winner! 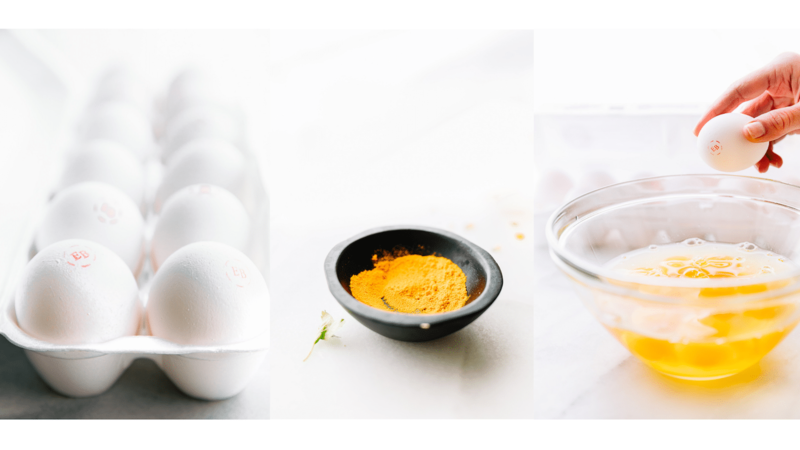 Since we are currently running the anti-inflammatory diet meal prep challenge, I decided we should combine my love with turmeric with my love for EGGS and make it a healthy meal prep recipe for breakfast, brunch, lunch, or dinner. 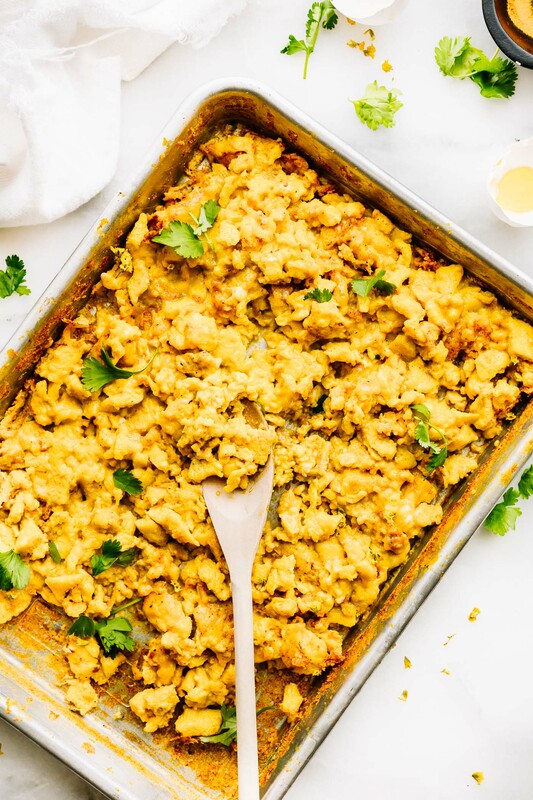 Yes, you can totally meal prep eggs and you can totally oven bake scrambled eggs all on one SHEET PAN! So bust out the eggs, the spices, the almond milk, and the sheet pan. We’re making Tumeric Oven Scrambled Eggs! 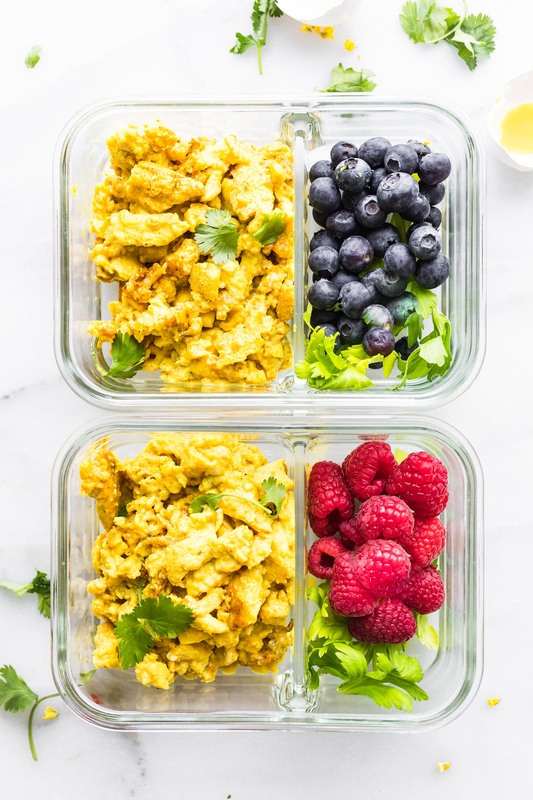 How are Turmeric Oven Scrambled Eggs good for healthy meal prep? 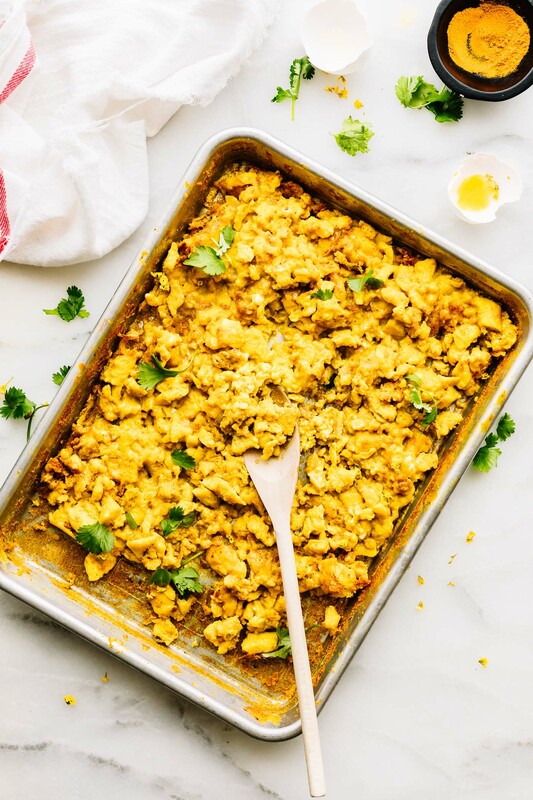 Essentially, turmeric oven scrambled eggs are baked eggs, cooked in the oven in a large casserole dish or a sheet pan (as mentioned above). That alone might save you some time and stove top space. All you do is whisk your eggs milk and spices. Then gently pour into onto a sheet pan (oiled) that has a couple inches of height as well. Then pop these in the oven, stir halfway, then bake again. All done in 15 minutes. No need to stand in front of the stove top and fry with butter. No unhealthy fats needed, just the good fats! Side note –> You can EASILY clean the yellow off the pan with a bit of baking soda or this Bar Keepers solution. I didn’t even have to soak the pan. 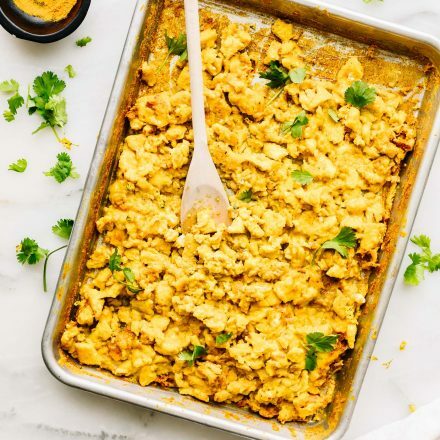 Oven “Golden” Turmeric Scrambled eggs for…. Breakfast, you can bake eggs in the oven to use for a hearty breakfast bowl, wraps, or even breakfast tacos (gluten free). 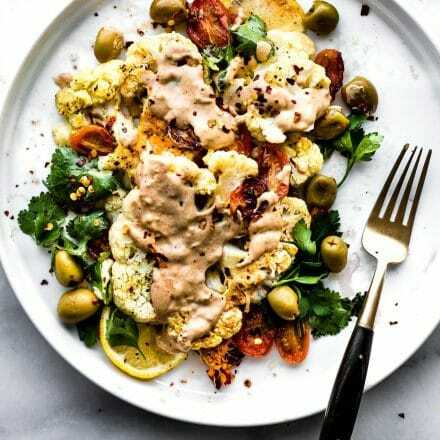 Lunch, add turmeric scrambled eggs to a salad, or serve them with some steamed veggies and maybe some lentils. Mmmm! And come on… who doesn’t like breakfast for dinner?! BRINNER! Simple with fresh fruit and gluten free toast or my homemade cinnamon almond flour bread! Now let’s talk about the recipe. The combo of eggs and turmeric are a match made in nutrition heaven! This meal is packed with health benefits to kick start your day! 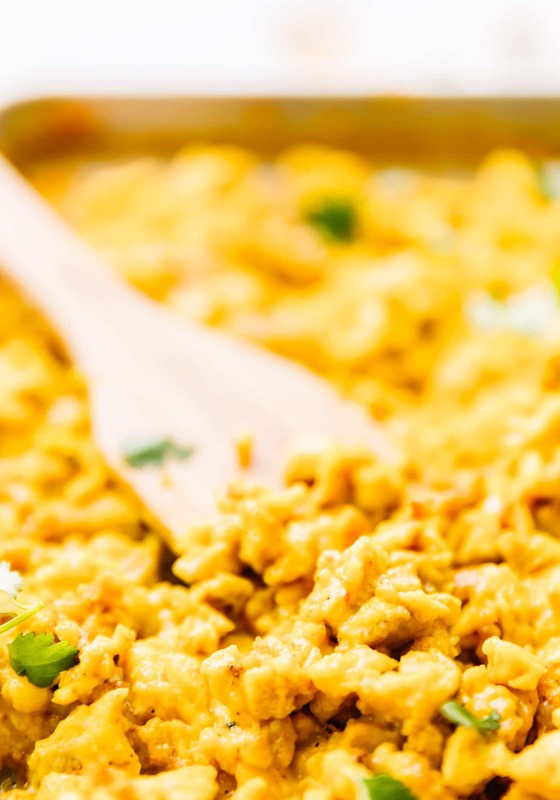 Turmeric helps brighten the flavor and color of scrambled eggs, and it has healthy perks! There is a compound called curcumin in turmeric, which is fantastic at fighting inflammation! Also, turmeric is a powerful herb that helps to kickstart your day. Turmeric is more effective than many prescription herbs, regulates cholesterol and even manages diabetes. EGGS! Oh the power of eggs! We use Egglands’ Best eggs around here because their eggs have almost double the nutrients than most. Eggland’s best has 125 m of Omega-3s compared to 49 mg in ordinary eggs. Omega -3’s are support heart health, brain and eye function, infant development, and alleviating hypertension. Eggs (in general) contain Vitamin D which can help boost bone density and is much needed during the darker month’s with little sunlight. Like now, Winter. Each EB egg contains 6 times more Vitamin D than ordinary eggs. 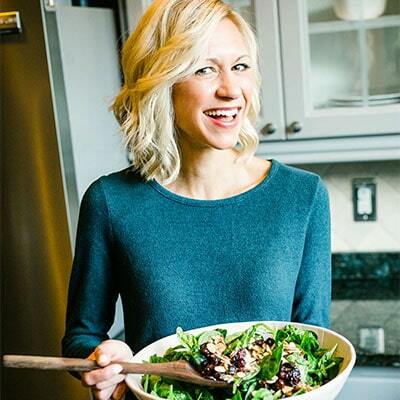 Alright my friends, we’re determied to keep this anti-inflammatory + meal prep challenge going strong! I hope you are joining! (FB Group here). Have you ever scrambled eggs in the oven? What’s your go to meal prep for breakfast? Any turmeric lovers out there? Show me whatcha got! Totally making this for breakfast meal prep! We love Eggland’s Best eggs! That’s all we buy! Thanks Laurie! I knew you’d love this one. So great for the mrep challenge! Oooh doing these in the oven is such a good idea! I’ve never used turmeric with eggs before! Only in rice and maybe chicken but this recipe looks really good! I’m definitely going to try this soon, thank you! I think you’ll like this in eggs Bryan! Keep me posted on if you try it! totally! and you can make lots of breakfast tacos for the boys from that as well! 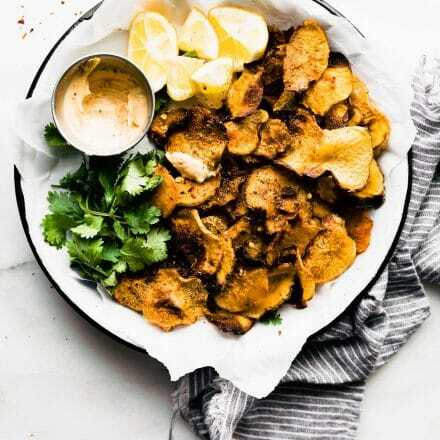 I have chronic kidney disease and this recipe would be great to reduce inflammation and yet getting some but not exceeding my protein allotment for the day! A definite must try! I love the idea of cooking scrambled eggs in the oven and the addition of turmeric is genius. I’ve been added dried garlic scapes to mine, but I’ll definitely have to try this. omg- that is incredibly inventive!! I love this idea! Oh that turmeric cleaning tip is gonna come in handy! I always seems to get it everywhere. 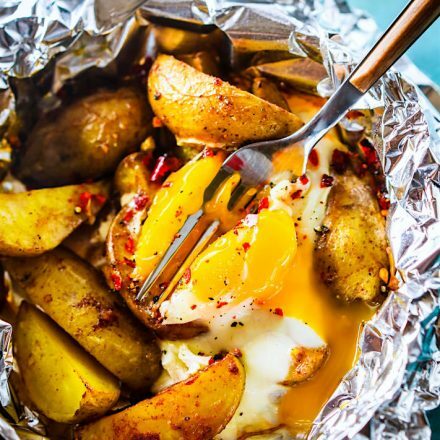 Love the idea of baked sheet pan eggs – so smart and easy! 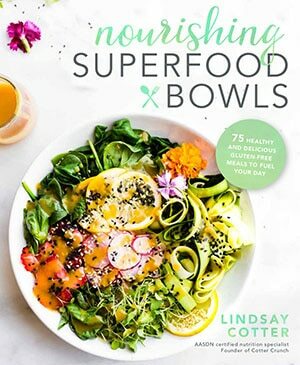 This is totally my breakfast and I love the turmeric addition! Awesome! Let me know how it turns out Gerry. I’ve never thought of oven scrambled eggs! So genius and we love turmeric too! What great way to add turmeric to your food! Scrambled eggs in the oven? That is really an amazing idea! THanks TOni! Let me know if you try it.